Semiconductor Engineering - The Semiconductor Future Looks Bright! Semiconductor Engineering - The Semiconductor Future Looks Bright! Home > Manufacturing, Packaging & Materials > The Semiconductor Future Looks Bright! The Semiconductor Future Looks Bright! SEMI Market Forum Report: Industry growth and outlook, and the impact of the Internet of Things. Referencing the forum theme, he commented that, “The new potential of the Internet of Things offers promise for the future of the industry.” In the subsequent presentations and discussions, four expert panelists shared their perspectives on industry growth and the impact of the IoT with an audience of 300 industry participants. This article summarizes their presentations. 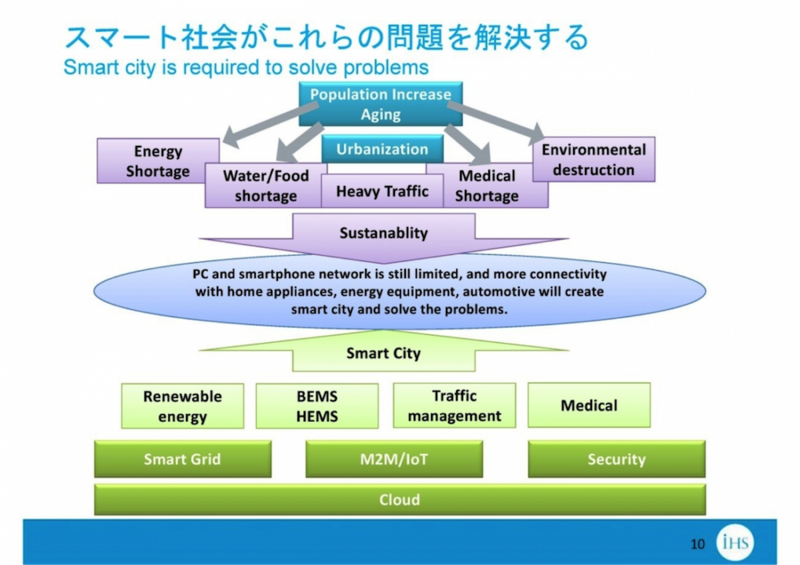 Akira Minamikawa, Japan Research Director at IHS Global, started his presentation with a question “Why do we need IoT?” He said the mega trends of population growth, rapid aging in the developed countries and the urbanization of population are causing energy, water, food, traffic, medical and environmental issues that will, in part, be addressed by IoT services. He also emphasized that regulations will drive the IoT services and help create new markets. Energy efficiency regulations for motors are being enforced in Europe, the United States and China, and similar regulations are planned also in Japan. Vehicle carbon dioxide emission controls are getting stricter in every region around the world. In Japan, the building energy conservation act will be mandatory and 2016. All these and other regulations will spur markets that IoT and semiconductor industry will serve. 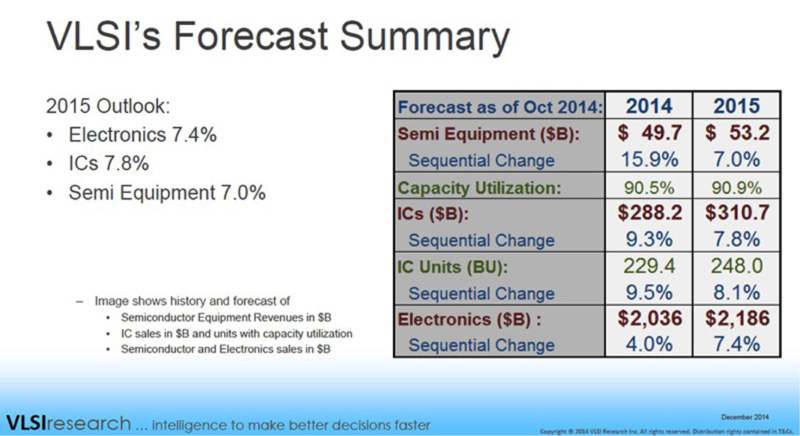 With the development of these markets, semiconductor device requirements also will change. Minamikawa expects the proportion of analog, power, discrete, opto and sensor devices will be an increasing share of the total semiconductor market while the proportion of memory, micro and logic will be smaller. He also foresees changes in the semiconductor manufacturers ranking in the coming years. 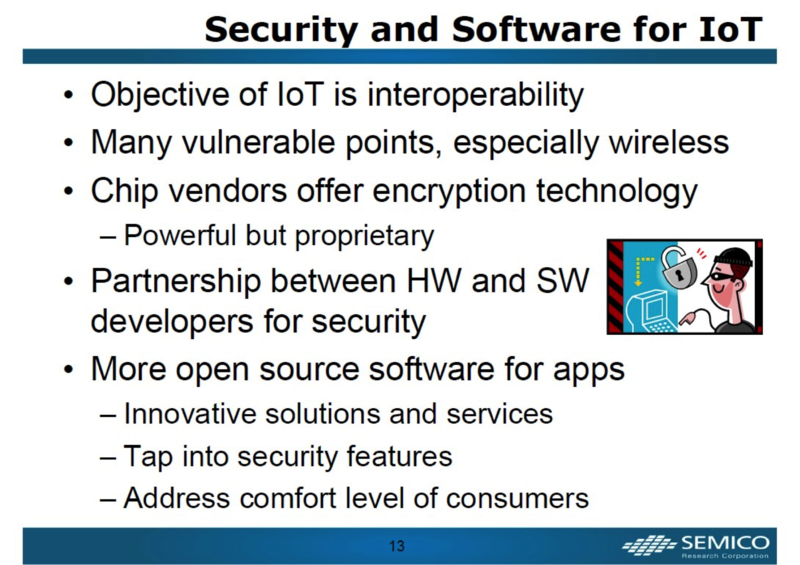 Jim Feldhan, president of Semico Research, discussed the market dynamics driving the Internet of Things. He explained the various markets that IoT will create. In the connected home sector alone, Feldhan expects that 23 billion residential appliances worldwide will be connected to the Internet in the next 10 years. From a semiconductor standpoint, this could translate into about 160 billion new semiconductor devices that will be consumed for this application. The residential connected home will represent about 20% of overall IoT total available market (TAM), according to the analysis by Semico. Health care is another huge market and “it is not just a fad,” Feldhan said. There are 860 million chronically ill people worldwide, and that is three times the current U.S. population. By 2050, 21% of the population will be over 65. Looking at the health care expenditures in the United States in 2012, about a half of total expenditure was spent outside of hospitals and clinics and this portion creates “great opportunities over the next decade for developing home health care electronics.” Feldhan forecasted that wearables will be the second largest market by 2018, just behind smartphones. Risto Puhakka, vice president of VLSI Research, presented his insights on semiconductor market status and outlook. He said that 2014 has been a very good year for semiconductor suppliers. “Our data tracked on a weekly-basis, monthly-basis, quarterly-basis, all indicate that businesses are going along very well.” But he cautioned the electronics pricing is not very good. He commented that pricing is the most sensitive indicator of potential industry problems on the horizon. Puhakka sees negative pricing trends in consumer, notebooks and tablet segments, while mobile handset or smartphones are showing positive pricing trends. He also noted that 2014 has been another hot year for DRAM. The strong pricing resulting from the limited capacity, DRAM sales outpace flash over the last two years. He also indicated that mobile/differentiated DRAM surpassed the commodity DRAM, and noted that Micron/Elpida benefited from this trend over the last couple of years. Then Puhakka presented VLSI’s forecast for each of the semiconductor equipment, IC and electronics markets to grow 7% to 8% in 2015. As to the IC inventory, he noted that the total inventory level is increasing, but he considers it low because the inventory to billings is at very low level. The utilization rates are significantly higher than in 2013. In some cases VLSI has seen capacity shortages especially on memory and DRAM sides. Dan Tracy, senior director of industry research and statistics at SEMI, provided an outlook for the semiconductor equipment and materials sector. He started his presentation with a discussion about correlation between the fab equipment spending and the installed fab capacity growth. When the industry was ramping 300mm production, and prior to the steep downturn in 2009, there was strong correlation between equipment spending and capacity growth. The industry has since recovered nicely with annual fab equipment spending of in the $30 billion to $40 billion range. However, year-over-year capacity growth has been much more rational (2% to 3% in 2014 and 2015) getting away from the overcapacity investments of the past. This has helped create a more stable pricing environment in the memory sector. Memory and foundry are the key sectors driving the equipment spending currently in the industry. Tracy also referenced the recently released SEMI 2014 year-end equipment forecast that indicates the market will reach about $38 billion in 2014 and is expected to grow about 15% in 2015 to $43.7 billion. Further details of the SEMI forecast can be found in the full SEMI press release. Tracy also highlighted changes in 200mm fab capacity composition. Comparing the 200mm fab capacity breakout by product category in 2005 and in 2015, he pointed to an increase of the foundry share from just 30% to 47%, almost half of the total 200mm installed fab capacity. Other categories that gained 200mm capacity share are discrete, analog and “MEMS and other,” which grew from 12% in 2005 to 28% in 2015. Lastly, Tracy commented on wafer area growth by diameter, and 300mm wafer shipments will increase by about 10% in 2014, while 200mm wafer area will grow by 3%, which is in line with the active fab equipment investment to this diameter. SEMI hosts market briefing sessions at every SEMICON show around the world. Upcoming market briefings will be offered in conjunction with SEMICON Korea on Feb. 4 and SEMICON China on March 18. Yoichiro Ando is director of marketing at SEMI Japan.